I have had a 2-kilo load of plain pili nuts just chilling in my fridge ever since my trip down to Bicol a while back. Though peacefully waiting in their bag, I knew I had to get started with them soon. I have been dreaming up of all sorts of ways to use them, running the gamut from sweet to savory. You see, all my life I have only had pili nuts one way – candied, as is it most often sold. Until my dad clued me in on raw pili, it never entered my head to look for them in any other way. The fruit of this tropical tree is harvested from areas in this region where they grow naturally. So far, there is no commercial farming of the pili trees (that I know of). So it all depends on nature’s bounty. Candied, they are delicious and addictive. Raw, they are lusciously nutty and heavy with oil. Either way, they are fantastic. They are high in calcium, phosphorus, and potassium, and rich in fats and protein. I have also seen pili nut oil on the market here but have yet to try it. – Place all ingredients, except for the oil, in a food processor. Process while slowly adding the oil in…start with 1/3 cup, then keep adding if you want it thinner. 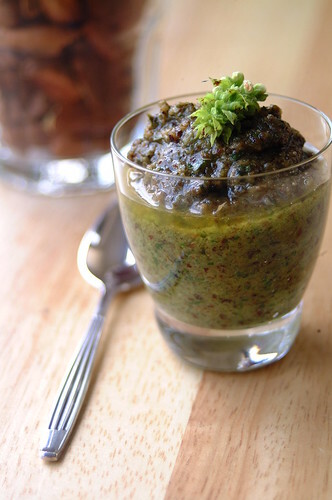 – Place pesto in a clean jar and top with a layer of olive oil. Store in the fridge. Makes about 1 cup of pesto. The earthy taste of the pili comes through just enough in this preparation, and the nut’s natural oiliness is perfect for pesto. I just used a basic basil pesto recipe to get this but I plan on experimenting with other locally grown herbs as well. I was too lazy to peel away the thin brown inner skin (as evidenced by the brown flecks you see in the pesto) but please feel free to do so. Although the skin is edible, and in my opinion makes the pesto taste “nuttier”, it is a lot of “roughage”, and who knows how that’ll interact with your digestive system right? My dad does peel his by blanching it quickly in boiling water then, when cooled down a bit, pressing the nut between his thumb and forefinger. According to him the nut will shoot right out of its skin with impressive speed and force…like a rocket. He goes on to say that it would make a super fun game to play…some kind of crazy battle of the pili-rockets? He insists that I try it, not for anything to do with the pesto’s flavor, but because, really, pili-rockets…how could I not want to try it? Ok, dad, next time…I’ll put on my pili-fighting-gear and you better get ready to defend yourself! Continued success in all you do… this truly looks delicious. 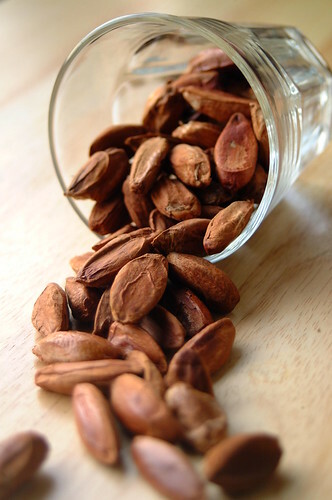 I hope to see more delicious recipes with Pili Nuts.